The spring window washing season is upon us! Right around March 1st is when we expect to start receiving all of the window washing calls. That makes February a good time to do maintenance work on our truck and window cleaning equipment. Most of the window washing companies out there like to purchase pure water window washing systems that are ready to clean right out of the box. Here at gleaming glass, we like to purchase all of our filters separately. We have found that it’s far cheaper to buy the filters separately, and then assemble our own pure water window washing system. Pure water window washing systems typically consist of a sediment filter, charcoal filter, reverse osmosis filters, and finally DI filters. We checked the quality of the water coming out of our filters last week and found that our reverse osmosis filter and our DI filter could both use a replacement. When we first got into the window washing business we decided it would be best to order a prepackaged pure water window cleaning system. At that time, we weren’t really familiar with how the systems worked, so we didn’t feel comfortable building our own. After we got the hang of things with our first system, we felt comfortable and confident enough to build our own custom system. Building your own pure water window washing system is much cheaper, and you also have the added benefit of the filters lasting twice as long. 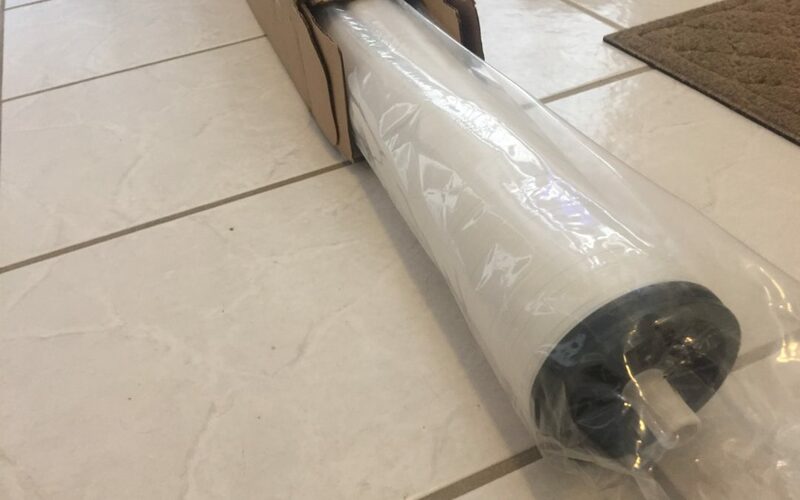 After we tested the filters last week and found that they weren’t performing as well as they should be, we placed orders for the replacement filters. The reverse osmosis membrane that filters out most of the contaminants found in tap water, arrived today! There’s always this feeling of anticipation and excitement this time of year. As soon as the box arrived with the reverse osmosis membrane inside, that feeling began to settle in. The feeling of anticipation and excitement is even stronger this year though! I have never been this excited for the spring cleaning season as I am for this one. This is the first spring window cleaning season we are going into while ranking on page one of Google for window cleaning related search terms! I fully expect that the incoming leads we get on our website and the phone calls we receive will double or triple. This is going to be an exciting season of growth for Gleaming Glass.